Most fans could only dream of meeting their idol in real life but for Malaysian singer-actress Kaka Azraff, her wish came true when she got the chance to work alongside her K-pop idol, Min. “I’ve been a fan of her since she was in Miss A,” said Kaka to TheHive.Asia at “IN Festival: Influencers 2018” held at KLCC last weekend. “So I was very excited when I got this chance to work with her. We have the same taste in music and stuff, and we just clicked,” she added. Both of the petite singers, along with actress Kim Jung-min, co-host tvN’s “Get It Beauty: On the Road Malaysian Edition”. 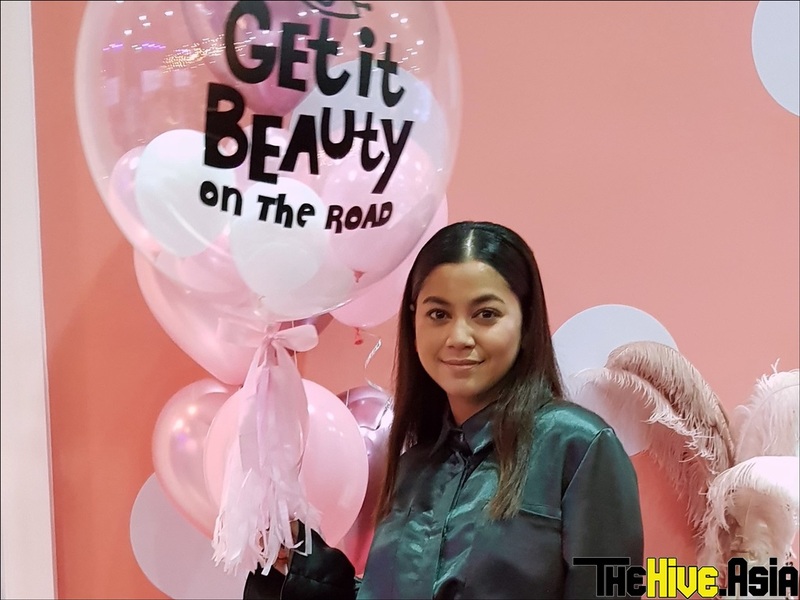 Though her co-hosts were not present at the “Get It Beauty” booth last weekend to promote the beauty show with her, Kaka was all smiles as she greeted fans who were excited to meet her in person. Kaka taking selca with her fans. While waiting for Kaka to make her appearance, visitors to the booth were treated to free removable tattoos. She also admitted that she would love to do a musical collaboration with Min in the future. Kaka also expressed her awe with the Korean beauty tips that she’s learned while doing the show, since when it comes to beauty regimes and products, Koreans have them down pat. “I’ve learned that [Malaysians] shouldn’t be afraid to apply oil to our faces, it’s what keeps the skin moisturised but we tend to shy away from it because of our humid weather here,” she replied when asked about her favourite beauty tips. “We should also massage our faces, jawlines specifically, so that the skin doesn’t turn saggy,” she added. Kaka sharing her favourite K-beauty tips. Well, with these beauty tips, the Malaysian star can continue looking pretty no matter how hectic her schedule gets! Aside from hosting “Get It Beauty: On the Road Malaysian Edition”, which airs every Monday at 9:00PM on Astro RIA in Malaysia (CH 104) and every Tuesday at 6:30PM on tvN in Asia, Kaka is busy juggling her acting and music careers at the same time, as she is also working on several movies and recording her first album which is expected to drop some time next year. When I was facing problems, I read your articles.I think this article has a lot of information needed. I wait for new articles.